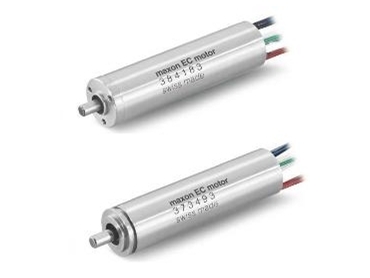 Maxon Motor Australia has extended its range of electric drives with the EC 13 and EC Size 5, designed for use in high speed medical applications of up to 90,000 rpm. Stand-alone, or as motor and gear combinations, these 50 Watt electric drives feature high power, extremely low-noise and low-vibration operation, marginal heat generation and minimal size. These characteristics are particularly useful for hand held power tool applications in the medical industry. Both drives are similar to their 30 Watt relatives, but offer an additional 50 percent of torque with only 11mm of extra length. EC 13 and EC Size 5 electric drives are of identical design, delivering torques of up to 8 mNm with an efficiency of 90 percent. The motor and gear head of the Size 5 variant possess a half inch outside diameter and a shaft of Ø0.125 inch, with the Servo Mount serving as fixation. The 13 mm variant comes with an outer diameter of 13 mm, an Ø3 mm shaft and a flange with 3 face side threads. ability to be sterilised in an autoclave. EC electric motors are available with Hall sensors and with three different windings. The gear heads come in reductions of 5:1 to 125:1, with or without output end shaft seal.